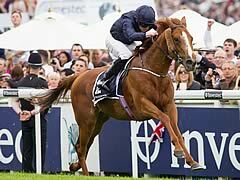 Ruler Of The World, trained by Aidan O'Brien and ridden by Ryan Moore, won the Investec Derby at Epsom. Hot favourite Dawn Approach failed to settle from very early on and Kevin Manning felt he had no option but to take up the running on the approach to Tattenham Corner, but the writing was on the wall some way out for the favourite. Ruler Of The World (7-1) showed a smart turn of foot to pass his stablemate Battle Of Marengo and go clear, but there were plenty in pursuit and and with the gap closing at the line, Libertarian flashed home to claim second, with Galileo Rock in third. The distances were a length and a half and a short head. O'Brien said: "We're just so lucky, we get these incredibly bred horses and even before they are mated the dream is for this to happen. The owners understand the game so much, they are given all the information and usually come up with a plan and we try and carry it out. "All the jockeys had their own plan and all the horses were doing their own thing and that is just the way it ended up. 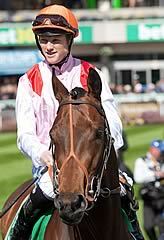 "This horse was impressive at Chester (winning the Chester Vase) and won like a very good horse. It's incredible, we're very privileged to be in the position we are." Coolmore supremo John Magnier added: "Joseph had his choice (of what to ride from the Ballydoyle runners) and Aidan thought this horse was the next best. That's why the Derby is such an interesting race, as it is all unfolding. "The weather has been so difficult, we haven't really been on the grass much and if you try to find out everything at home, you are not going to win the Derby." Karl Burke was left wondering what might have been after 14/1 shot Libertarian finished strongly to finish a length-and-a-half second behind Ruler Of The World in the Investec Derby. William Buick’s mount was switched off as expected at the rear of the field in the early stages of the race but the slow pace meant that the son of New Approach was not seen to best effect until the latter stages of the Classic, by which time he had too much ground to make up. Burke, who is assistant trainer to his wife Elaine at their Leyburn base, was adamant that their three-year-old would have won with a stronger pace but is looking forward to the future with their stable star. “The first thing William (Buick) said as he got off was that the pace of the race has done for him,” said Burke. “They went really slowly for the first part of the race and then they kept quickening it up and slowing it down until the field reached Tattenham Corner. “We’re delighted with him though and we’ve know we’ve got a proper horse. He’s lived up to all expectations and more. When we got him at the beginning of the year, we thought we had a nice, raw three-year-old who could be a staying type but he keeps on getting better. He’s come on so much in the past three months. David Wachman was also beaming after 25/1 shot Galileo Rock finished a short-head behind Libertarian in third but the Irish handler refused to be drawn on where his colt could go next. “He’s a smart horse and we’re very happy with that,” said Wachman. “He’s still very babyish and ran green as he rolled about a bit in the final stages of the race. He’s travelled nicely though and the slow pace wouldn’t have suited him that well as they didn’t go a gallop at all. “I’d think he’d improve for this run but I don’t know where he’ll end up next. We’ll get home and have a good think about that over the next few days. He’s not really surprised me as we’ve always thought he’s nice. We came here a bit under the radar which we were happy about. Dawn Approach kept pulling for his head as rider Kevin Manning held him up fifth last in the 12-strong Investec Derby field. The 5/4 favourite would not settle at all and pulled himself into sixth place, then went second as the runners came over the top of the hill and soon took the lead. But his advantage did not last long and Manning accepted the situation as Dawn Approach dropped back to finish last. Manning said: “He ran too free. A 100 yards out of the gates, he got competitive, ran too free and was carting me. “He ended up pulling me there and I didn’t have any choice. I am running three deep (wide) and I just cannot get a pull out of him – I am just a passenger. Dawn Approach’s trainer Jim Bolger commented: “Kevin said that he jumped out all right and he was OK for about 10 strides. There wasn’t much pace on and the horse grabbed the bridle – from then on, he was more or less out of control. “There was no pace and the horse did not settle. There was nothing there when Kevin pulled him out. 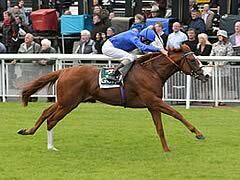 “Dawn Approach had been running over a mile where they were jumping out with a strong pace. Kevin just dropped his hands down his withers and let him bowl in those races. “I doubt you will see Dawn Approach again over a mile and a half. We will take him home and see how he is and train him for a while. Time will help us to decide (what to do).